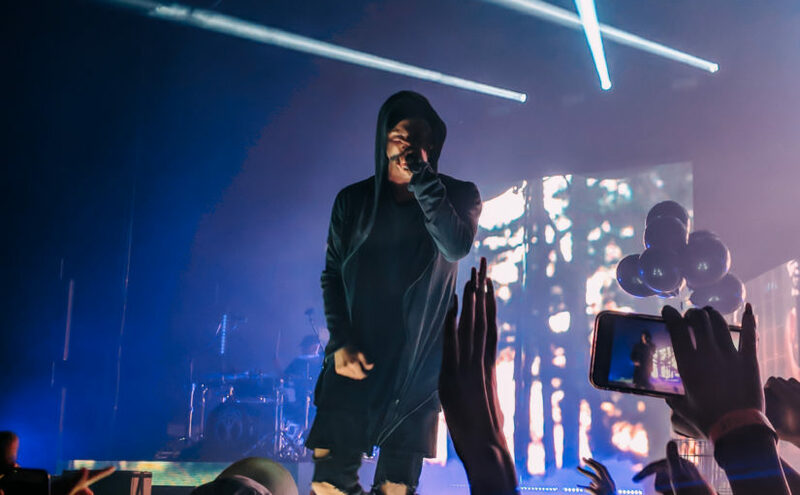 NF dropped bodies at the concert–literally. From country to rock, to indie to pop, I’ve seen it all … or so I thought. I have failed the title of an avid concertgoer. Never before have I attended a rap concert, until this past weekend. NF performed at The Armory in Minneapolis, Minnesota last Saturday, Oct. 6. Needless to say, I’m already looking forward to my next rap concert. The venue plays a huge role in the overall experience of a concert and can make or break the whole event. For example, First Avenue is kind of a dump (lest we forget when the roof collapsed), but the history of the place makes it special. The Fargodome, on the other hand, made for a rather awful experience with its poor audio equipment. The Armory was new to me. Before the concert, I researched the history of the venue and was pleased at its richness. According to the history page on the website, The Armory was the most expensive building in Minnesota at one point. For decades, the building was mainly used for civic events, which included concerts and sporting events. Most interestingly, Minnesota’s sweetheart, Prince, used the venue to film the music video for his hit “1999.” Even Aerosmith used it for a music video. The building was protected by the state in 1993, as there was talk about tearing it down for the purposes of building a county jail. Years later in 2017, The Armory made a return to what it was once known and loved for — concerts. The Armory was made for music. With its dome-like ceiling, the sound was impeccable. The openness of the venue would lead you to believe that there would be room to breath, and there was, just not for some. Unfortunately, several individuals met their fate with medics after fainting during the show. My first impression of NF was Eminem meets Twenty One Pilots, but upon seeing him perform and seeing his personality come through with his stage presence makes me think he’s unlike most. I can totally appreciate someone new who steps onto the scene with something fresh. His songs are sad with remnants from his troubled past, but most are hopeful and talk about change. 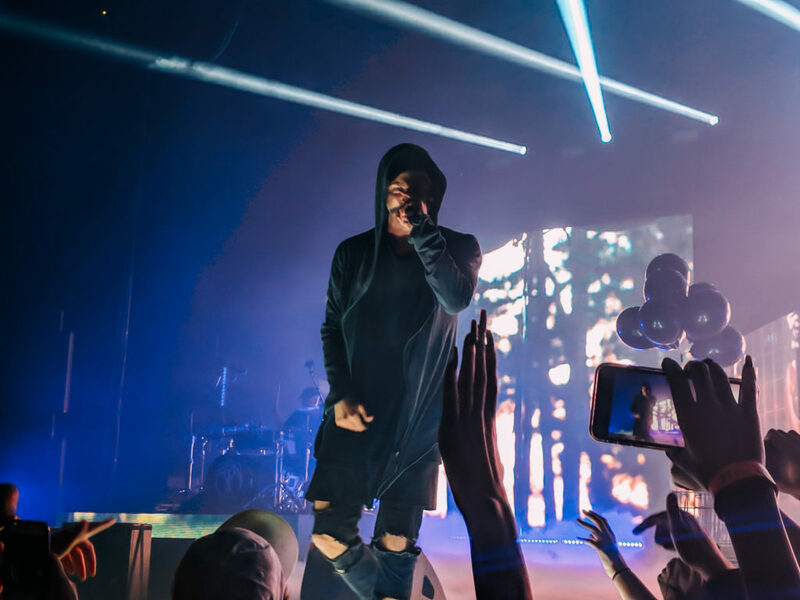 NF was engaging and offered some relief to the crowd by using dry ice instead of fog machines to create the haunted atmosphere to match his sound. Before exiting the stage with his last song of the night, he thanked the crowd and professed his appreciation for performing the biggest headlining tour of his career. I, along with his cult following, were happy to be a part of it. While rock and indie concerts offer high energy throughout their songs with a ballad to slow things down, NF did this in one song. With each song came times where the crowd was jumping and the floor was bouncing and times where the crowd was still, clutching at their heartstrings with sorrowful lyrics. Anytime NF comes to town, I will be attending. I finally feel like a well-rounded concertgoer. Now, if only Kanye can be reliable enough to hold a tour.